Now that I have had a few days to recover from Tianguis Turistico, and to reflect on the four-day event, I have decided that Mexico does a hell of a good job of accomplishing their purpose – bringing everyone involved in Mexico tourism together to get some business done. Having attended these for about ten years now I’m not sure that I have ever seen as many one-on-one meetings taking place between buyers and sellers and a general enthusiasm amongst all attendees. Fellow Mexico Premiere ladies Lisa and Lola and I were amongst about 30 Americans and 13 Canadians who were invited by the Mexican government to attend press conferences and learn more about Mexico travel, with the hopes that we will help promote the country in the media. It’s an honor to be on the invitation list, and we take that responsibility seriously, but the truth is, we’re big Mexico fans and would be writing about the country anyway. There was some grumbling from some of the press that our (media) importance has been diminished, that we aren’t as catered to as in the past, but for me I’m just happy to be there. I figure they owe me nothing, but instead I get a flight, an oceanfront hotel room with a great daily breakfast buffet overlooking one of the world’s most beautiful bays, and an ID badge to hang around my neck. We get a press room with computers and long distance phones and we learn more about Mexico travel. Did I mention parties and dinners every night where you can’t pay for a drink or food? No, I won’t complain about any of it. And neither should anyone else. As for Mexico tourism and what we can expect this year: I think it’s safe to say that the travel industry is going to have some challenges everywhere. Airlines are suffering with higher fuel costs, and fewer people have travel money to fill more hotel rooms. Europeans are enjoying a strong currency and will help somewhat, but in general it should be a relatively slow year. Of course Mexico has some advantages that always help: great weather, beautiful beaches, a fascinating culture, old-world colonial towns, and simply the nicest people I have encountered. The country has had some bad press this past year to be sure, but unless you’re engaging in personal dealings with one of the drug cartels, you won’t be affected by the battles being waged. My best advice for you if you are going to Mexico this year is to try something different. Look into the smaller boutique hotels for a change, many located in places you would not normally visit (see www.mexicoboutiquehotels.com), and check out the cheaper domestic airlines that have started in the past few years, servicing routes that the major carriers ignore. Or if you just want to sit, drink and chill, go back to that luxury resort on the beach and recharge. Just go. Puerto Vallarta has always been my favorite town, my One Particular Harbor, as Jimmy Buffett sings about. I first drove there in the summer of 1970 in an old VW bus from San Diego not long after the road was completed into PV from Tepic. I know things change, but Vallarta was an entirely different place then. It was, quite simply, perfect. Since that first trip I have been just about everywhere in Mexico and other Latin countries, and most of Europe several times. But nothing comes close to the PV I found nearly 40 years ago. I won’t try to describe what it was like on this blog, that would take a book or many hours over beers. 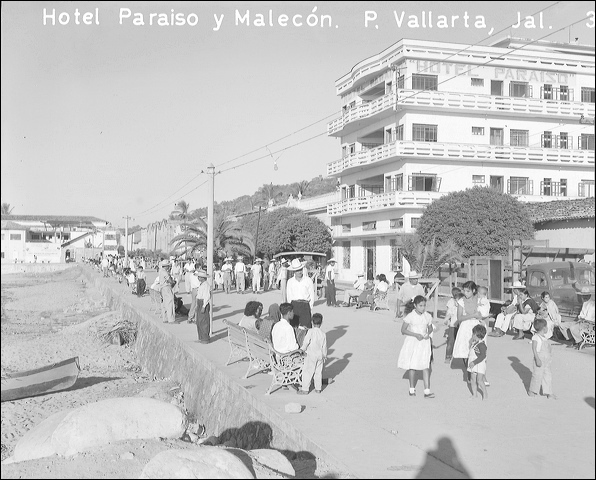 But I have found a great online photo album by someone named Chico on the web site PhotoBucket that displays over 100 vintage images from all over Vallarta…the streets, malecon, airport, beaches. Most are black and white and only a few identify the date taken or the specific subject. Most of the dates I did see were early 1960’s, although one was dated 1924, and many more look at least that old. The first thing you notice is no cars, and then you see the hills before the houses started to climb their sides. And the dress of the locals, you don’t see gringos, could be from 100 years ago. Anyway, take a look at this amazing collection of what the perfect town looked like at one time in history, and understand that progress is a very confusing and damning concept to many of us who remember. Earlier this week, the 33rd annual Tianguis Turistico 2008 took place in Acapulco. Recognized as Latin America’s most important tourism platform, this enormous marketing mechanism is the 7th largest tradeshow of its kind in the world. Throughout the event, buyers from more than 20 countries meet with Mexican suppliers to map out the course of the country’s tourism. The event also hosts specialized media from around the globe to ensure coverage of countless press conferences, announcements and destination news. The Secretary of Tourism of Mexico, Rodolfo Elizondo Torres, lead the “North American Market Trends” discussion forum, in which six specialists emphasized the efforts of the government and of the national tourism industry to boost this market and also, the great opportunities that the country offers to be more competitive in diverse segments. The forum was led by the head of Sectur, Elizondo, and was accompanied by Sarita Skidmore, President of MENLO Consulting and expert in Travel Style studies; Peter Yesawich, President and General Director of Yesawich, Pepperdine & Brown and specialist in advertising and tourism trends; Viviana Rojas, academic in the University of Texas and investigator in retirement tourism, “baby boomer” phenomenon, and second residencies in Mexico; Ray Snisky, President of Mark Travel Corporation; Michael Pusateri, Executive Strategy Consulter of Vantage Strategy and Deborah Sexton, President and General Director of Professional Convention Management Association (PCMA). Elizondo Torres emphasized that Mexico has many opportunities that it should take advantage of, every time that the dynamics of tourist activity demand it. “The tourism activity is very dynamic and every day there are new possibilities such as the business, medical, real estate, adventure and cultural tourism and Mexico has that in one way or another, so I see with great enthusiasm the opportunity that our country has to move forward, working in the United States and Canada markets,” he commented. During the panel, Sarita Skidmore, president of MENLO rated the country’s performance with a nine, but said that Mexico must work to lure in tourists even with the recession in the United States. Also Ray Snisky, President of Mark Travel Corporation, rated the country’s performance with a nine, nevertheless, he pointed out that although Mexico raises interest in North Americans, it is necessary to make the country more accessible. He reminded that this market has short periods of vacation time and although the flight distances are short, they are made longer due to difficulties with flight connections. Regarding business tourism, Deborah Sexton highlighted that Mexico is the second preferred destination by North Americans and that it has huge opportunities to convert itself in number one. She pointed out that technology, quality of service, price, and precision are keys to these kinds of tourists. Peter Yesawich emphasized that Mexico deserves a 10 in regards to the travel experience and an eight in promotional matter. Regarding the average qualification of the North American travel experts, Elizondo Torres emphasized that it reflects the job of, not only the government, but of all those involved in the national tourism industry, as well as the opportunities that are ahead. Tianguis brings together the best of Mexico and it looks like 2008 is on track to be another be another banner year for development and tourism. Acapulco, MEXICO (April 15, 2008)—MexicoPremiere.com, the Internet’s hottest blog on anything and everything Mexico, and Mexico Boutique Hotels, an outstanding collection of some of the coolest boutique hotels in the country, came together in Acapulco during Tianguis 2008 to announce the establishment of the Nick Gallo Award. “Every once in a while, a freelance writer will come along who brings the ‘writer’ part of his title into full prominence,” said David Simmonds, one of the founders of MexicoPremiere.com. “Nick Gallo was one such guy and, sadly, one that left us all behind way too early. We wanted to establish this award for freelance writers to celebrate his life and his work. Knowing him, he’d think it was hilarious, but we know it’s very well-deserved.” Nick Gallo, winner of the Mexico Tourism Board’s highly competitive Pluma de Plata award, regular contributor to such prestigious titles as Travel & Leisure, Alaska Airlines Magazine, United Airlines Hemispheres, Private Clubs, Northewest Airlines WorldTraveler, father, husband and matchless colleague, died last October while on assignment in Greece. A touching in memoriam written by fellow writers can be found at www.mexicopremiere.com/?p=256 . “Nick’s sharp wit, his humor, his way with words and his professionalism—not to mention the simple fact that you could truly see that he loved what he did—are just a few of the reasons we are so honored to be a part of this award,” said Sylvie Laitre, Director of Mexico Boutique Hotels. The Nick Gallo Award will be handed out every spring, the date to coincide with Tianguis, an event which brings together the best and the brightest writers from across the United States and the world. The winner will receive an engraved Mexican handicraft plus a three-night stay for two in a participating MBH property, including air from a U.S. gateway. Entries are only open to freelance writers based in the United States and Canada. Mexico City – Markets in the capital are always worth visiting and the green markets are not to be missed. 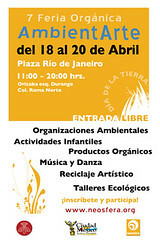 The seventh AmbientArte takes place April 18-20, 2008 in Colonia Roma, Mexico City and kicks off the celebration of Earth Day in Mexico. The three-day event showcases environmental groups and producers of natural goods and art from around the country. There are also workshops and cultural events. In Mexico the holiday is known as Día de la Tierra. Look for events near you! Just a quick note to let you know the gang’s all here in Acapulco for the big Tianguis Turistico trade show! We have been meaning to blog daily, but just can’t keep up with the events, press conferences and, of course, the spectacular parties. We will fill you in on Thursday. Hasta Luego! This week the Tianguis Turístico returns to sunny Acapulco. While I am not participating in person, I will be paying attention to the event thanks to Mexico Premiere. Here are a few questions I’d like to ask tourism officials. Answers posted as responses to this post are much appreciated. Will the Tianguis Turistico be documented via Flickr or YouTube? Like many other journalists, I am opting to receive media releases online, but not via email. Are state or national tourism news feeds available via RSS? As a two-time winner of the Lente de Plata I was surprised to see the award disappear this year. Are there plans to revive the Lente and Pluma de Plata Awards next year or develop other awards? Are statistics available that document national and internation tourism revenue in Mexico? Many countries are implementing programs to connect tourism and climate change. Is Mexico conducting research in this field? Are there action plans to combat climate change in the field of tourism?